Travel trailer maintenance is essential to keeping your RV like new. You only need to monitor a few things on a regular basis to keep it in tip-top shape. You remember the feeling you had when you first bought your camper. The new smell, new look, clean interior and exterior, new carpet, shiny floor and the uncluttered space. All this can still be yours, even years down the road. All you have to do is keep a few minor things in check. Let's look at some of the travel trailer maintenance items that need to be on the list. When you walk through the door, check the hinges. Make sure the door opens and closes smoothly, without having to slam it. The latch will need oiling to ensure proper use. The screen door latch need to be operational as well. Check all interior lights and make sure they all work. Replace bulbs as needed. Keep the globes clean and dust free. Make a point to look at the edges of your carpet. It can get frayed easily by just walking on it. Repair if needed. While you are on the floor, check your linoleum for cracks or tears. Glue them as soon as you find any to keep it at a minimal. Good travel trailer maintenance is looking for and fixing things before you need a repair shop appointment. Make sure all your floor ducts for the heat are intact and not full of small objects. Vacuum them out and check for leaks. Inspect your walls for mouldings that may have come loose. Tack or glue them back in place before you have to replace it. When looking at the exterior of your travel trailer, check the siding. Make sure all the joints are caulked and not leaking water. All outside bulbs need to be checked for moisture. If they have moisture, reseal them to ensure a water-tight seal. This will keep your bulbs from bursting and possibly a traffic ticket for a safety violation! Side marker lights and reflectors need to be checked for looseness. Tighten as needed. Check your window screens. They will deteriorate in the sun. They rot and fall apart. Replace them as needed. You can re-screen them yourself and save some money. This travel trailer maintenance is one you will be thankful you did when you want to open the windows for a bug free camp-out. When looking at your slide-outs, if you have one, make sure the seals are not cracked or torn. If you find one that needs to be repaired or replaced, get it done as soon as you can. Those heavy walls will push and pull on the seals every time you open and close the walls, making it bigger. Wash the exterior to keep it new looking. Use a good RV wash and wax. Rinsing it thoroughly will prevent streaks on the sides and windows. 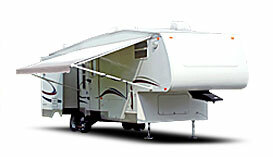 Check your RV awnings for roll-up evenness. You want it to roll up without any kinks or folds. If it has some, unroll it and re-roll slowly watching for flatness as it goes in. Wash it occasionally, also. The roof needs to be examined for tears in the rubber. Tree limbs are the worst at tearing it when going under them. Some hang over the road and may scratch it leaving a rip. Repair it now to save additional costs and water damage later. Use a rubber roof repair and sealant solution only. Clean out all vents, like the hot water heater, vent fans and refrigerator vent. Wasps and dirt daubers will build up in them and cause quite a lot of damage, not to mention bee stings. Travel trailer maintenance does require some crawling around under the RV at times. Get you a can of WD-40 for light duty lubing and a can of white lithium spray grease. Use the WD-40 for baggage door latches and hinges. Spray some into the lock cylinders in the lockable compartments. Spraying the step hinges will keep them operational and easy to pull out and push in. Be sure to get all movable parts of the steps. This will eliminate that awful squeak when stepping up or down. You know what I'm talking about! If you still have a squeak, check the mounting bolts on the body of the travel trailer for tightness of the bolts. Tighten as needed. I have wished other folks would use a little travel trailer maintenance on their steps when everything is quiet, except for their squeaky steps. On the interior drawer slides, spray them with WD-40 to ensure a smooth glide when opening and closing them. Nothing is more aggravating than a sticking drawer. Cabinet door hinges need to oiled for ease of use. While checking door hinges, don't forget the shower door. It may require lubrication more often due to the moisture they are exposed to. The white lithium spray grease will need to be used on the heavy duty stuff like the slide out mechanisms and gears. Use it on the landing gear and jacks. These carry heavier loads and require a heavier grease. You may want to keep a rag on hand to wipe off the excess drips and runs that will attract dust and dirt. Don't over-lubricate or over-spray or you will increase your work load by adding to your clean-up time. Your axles and suspension parts will require an automotive based, high pressure grease. These items exert extreme pressure on their pivot points and require a heavy duty lubricant. Most new travel trailer axles require the use of an automotive type grease gun. The fittings are in the center of the hub with a alomite fitting. The grease gun fitting will lock onto the fitting on the hub. Pump the handle to fill with grease. Older model axles will need to be taken off and greased manually. They will require packing like a wheel bearing. This travel trailer maintenance is no fun, but is needed. Your travel trailer awnings will need to be oiled with WD-40. Check all pivot points for smooth operation. Keep in mind these stay in the weather all the time, so dust and dirt will gather in the rollers and will need to be cleaned out. The fabric will need to be cleaned to keep it from holding stains. Use an RV cleaner made for awnings. A good wash/wax solution will prolong the life of it. You will be glad you took the time to do travel trailer maintenance on your awning when the sun is beating down on you and you need shade or when it is raining and you need a dry place to sit outside. Tire pressure need to be checked quite often. If your RV has been sitting for more than 2 weeks, check the tire pressure. Never roll it out for a trip without an air check. 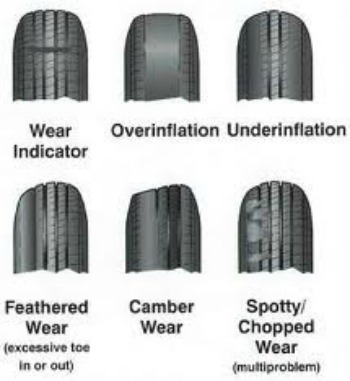 Every 6 months, check the tires themselves for cracks, abrasions and irregular tire wear. Irregular tire wear is a good indication that you have suspension parts wearing out. Check the rims for cracks. This could cause a leaking tire. Potholes are the worst thing to run over, due to the weight of the RV being pressured on the wheels. Avoid all road hazards and debris. 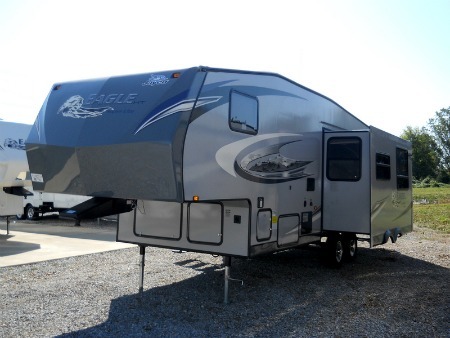 Keeping your travel trailer level will keep the tires on the ground even all around. It will keep from having a bald spot on one edge of the tires. Whether your RV sits on an uneven surface, be sure to level it to ensure the doors shut properly and the drawers open and close without being in a bind. There are areas of water maintenance that need to be addresses as well. Your potable water tank will need to be treated if you don't use it very often. Using a fresh water treatment will keep bacteria from growing inside the tank. Check all seals on the water tanks, including grey water and black water tanks. These water tanks are essential to the safety of your campers. Water grows bacteria and micro organisms that can be dangerous to your health. Use a good water filter in your line when using community water. It will filter out many sediments and keep your water tasting fresh and good and will also keep your seals at the water outlets from corrosion. Replace it as needed. Travel trailer maintenance has it's rewards. 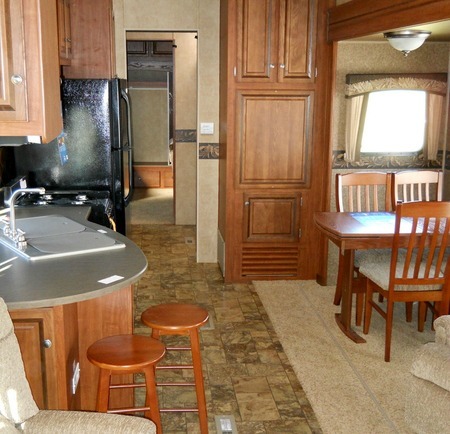 If you decide to trade in or sell your RV at some point in time, you will love the extra money added to your value. It also gives you a good feeling to know you have taken care of your RV, so the next owner can enjoy it as much as you did. If you have any travel trailer maintenance tips to share, please do. We would love to hear them.